Our vacation rental condos and townhomes rates are seasonal. The Holiday Rates quoted are for the high season rates. December to April each year is the peak season in Tucson, Arizona. Most of our condos are located in resort style communities with heated pools, work out facilities, tennis, etc. All of the units are fully furnished. They include washer and dryer, all linens, and fully equipped kitchens. If you dont find exactly what you are looking for, call our office at (866) 460-2784 , we have new properties coming online all the time that may not be on the website yet. Our townhomes are generally a little more spacious and private than condos. These properties are a nice option for those who prefer a little more solitude. They include washer and dryer, all linens, and fully equipped kitchens. If you dont find exactly what you are looking for, call our office at (866) 460-2784 , we have new properties coming online all the time that may not be on the website yet. These are individual free standing vacation homes. Many feature heated pools and spas, as well as other amenities such as pool tables, game rooms, etc. 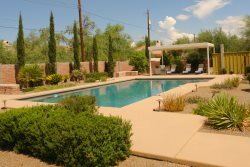 We offer homes all over Tucson and at many price points. All of our vacation homes are fully furnished and include all linens and fully equipped kitchens. If you dont find exactly what you are looking for, call our office at (866) 460-2784, we have new properties coming online all the time that may not be on the website yet.